The tug Arthur Foss features a Voith-Schneider cycloidal propulsion system powered by two EMD diesel engines. The Arthur Foss. the fourth in ceremonies at Foss Terminal tractor- ttl^ToFToss Launch & in Seattle, Wash.
Transamerica Delaval twin "Enterprise" OMR 46 engines (each 3500 hp), mounted on Chockfast Orange", power the rugged workboats of Biehl, Inc. Kuyper gears with cast-in- piace Chockfast alignment also help to assure powerplant dependability. High-performance products and worldwide service from factory-trained and certified chocking specialists. Chockfast Orange" has earned a reputation for reliability • more than 15,000 main propulsion systems, plus • genera- tors and auxiliary equipment • sterntube, strut, pintle, rudder and pedestal bearings • steering gears • engine-room and cargo pumps • anchor wind- lasses • bow thrusters • cable penetrations • stern winches. 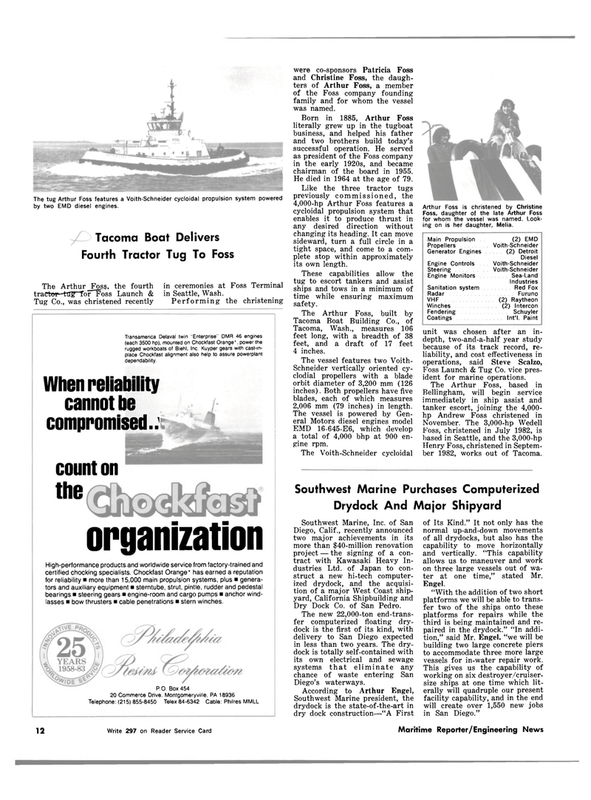 Telephone: (215) 855-8450 Telex 84-6342 Cable: Philres MMLL were co-sponsors Patricia Foss and Christine Foss, the daugh- ters of Arthur Foss, a member of the Foss company founding family and for whom the vessel was named. Like the three tractor tugs previously commissioned, the 4,000-hp Arthur Foss features a cycloidal propulsion system that enables it to produce thrust in any desired direction without changing its heading. It can move sideward, turn a full circle in a tight space, and come to a com- plete stop within approximately its own length. Tacoma, Wash., measures 106 feet long, with a breadth of 38 feet, and a draft of 17 feet 4 inches. Schneider vertically oriented cy- clodial propellers with a blade orbit diameter of 3,200 mm (126 inches). Both propellers have five blades, each of which measures 2,006 mm (79 inches) in length. EMD 16-645-E6, which develop a total of 4,000 bhp at 900 en- gine rpm. Foss, daughter of the late Arthur Foss for whom the vessel was named. Look- ing on is her daughter, Melia. Foss Launch & Tug Co. vice pres- ident for marine operations. Henry Foss, christened in Septem- ber 1982, works out of Tacoma. Dry Dock Co. of San Pedro. Southwest Marine president, the drydock is the state-of-the-art in dry dock construction—"A First of Its Kind." It not only has the normal up-and-down movements of all drydocks, but also has the capability to move horizontally and vertically. "This capability allows us to maneuver and work on three large vessels out of wa- ter at one time," stated Mr.
Engel. "With the addition of two short platforms we will be able to trans- fer two of the ships onto these platforms for repairs while the third is being maintained and re- paired in the drydock." "In addi- tion," said Mr. Engel, "we will be building two large concrete piers to accommodate three more large vessels for in-water repair work.